Employee Benefits- What do your people really value? Home » Insights and News » Keeping your Employee Benefits competitive – what do people really value? Most firms keep salaries under constant review but should you be evaluating or redesigning employee benefits in order to boost employee retention or attract great talent? Since a number of salary sacrifice perks are no longer tax free, many firms will have given consideration to how this changes the shape their benefits packages. With the growth of cloud and smart co-working software and the rise of the millennial generation, the way in which we work and our workplace priorities are changing. So do you really know what it is that your employees value? How can you ensure your perks stay competitive in this dynamic and technologically advancing environment? 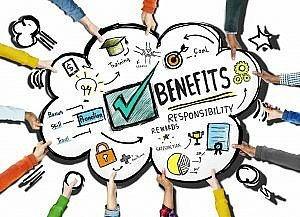 A survey conducted by Jobsite revealed the high importance that staff place on a good benefits package. Indeed, 86% of respondents reported being influenced by benefits in deciding whether to move jobs or take a new role. It is of course the case that for most staff the base salary is the most important consideration. However if that figure is acceptable then the quality of the benefits package comes into its own. Despite this statistic, the study indicated a level of discrepancy between the benefits HR teams believe to be most compelling in attracting and retaining staff, and those most valued by employees in reality. 62% of HR leaders rated their packages as “very good” or “quite good” compared to 47% of staff. In particular, it was clear that ‘lower value’ employee benefits such as office-based perks and social events are received with far less enthusiasm than HR decision makers might hope. The survey highlights the importance of maintaining an open conversation regarding staff perceptions of company benefits. It seems there is not always enough knowledge within HR teams of staff priorities when it comes to benefits. A good benefits package has an important influence over staff decisions and job moves. Companies should understand what employees value to aid staff retention and attraction. Prism’s own experience also suggests that smaller firms underestimate the value of benefits. Their reluctance to have a full package is partly because they are seen as an administrative burden and of course because they cost money. However, they most definitely have an influence on employee and candidate decisions as clearly without these benefits, both the administrative burden and costs are transferred directly to the employee! If a candidate has been used to a comprehensive package of benefits at a large firm, loss of these benefits at a smaller firm amounts to a reduction in remuneration in absolute terms. Also there is a symbolic aspect: benefits can be perceived as representing bigger firm aspirations. Also, make sure to remind your staff exactly what their benefits packages include. Sometimes the differing perceptions of employees and HR regarding the quality of their packages can be explained by staff not realising exactly what benefits they are receiving and their value. Indeed, at Prism, we often come across candidates who struggle to recall their allowances and benefits. Ensuring staff know exactly how good their packages are can act as a positive retention tool. What benefits do your staff value most? Dipa Mistry Kandola, Head of Flexible Benefits Services at Lane Clark & Peacock LLP, not only emphasises the need for HR to analyse data to identify trends in staff retention and salary etc. but also to ask staff what they actually want. She says, “that’s what a lot of our big and small clients fail to do. You can’t just ask via surveys. You’ve got to ask employees in small focus groups ‘what do you think about our benefits and rewards”. But also be aware that the discussion requires care: people might say they don’t value an existing benefit or a prospective one because they don’t fully understand the value, in the broadest sense. Interestingly, Jobsite’s survey revealed that 85% of employees surveyed thought they were able to benchmark their benefits package vs those on offer at competitor firms. For HR, this stresses the importance of keeping equally as up-to-date with what competitors are offering in order to prevent poaching and to stay competitive when attracting talent. Moreover, it indicates the role that employee benefits packages can play in shaping perceptions of company brand. Jobsite’s survey also provides valuable insight into the differing priorities of staff when taking into account age and demographic. It reported that workers under 35 say that a better benefits package was the first priority when compared to other motivators such as training, promotion potential and discretionary financial incentives e.g. bonus. This compared to 40% of workers over 45 who said that better work/life balance was their primary concern. Prism’s own Job Search Survey carried out at the end of 2018 gives further evidence of the importance of salary and benefits in attracting talent. It was also younger staff who appeared most interested in holistic benefits around wellbeing and health. An example of such a benefit was mental health support. This perhaps reflects a growing openness around the topic of mental health as a whole. Although such support appeared in the top ten most valued benefits by staff, it was overlooked by HR management when asked what they believed their people valued. Younger age groups feel most positively towards tailor-made employee benefits packages. Overall a huge 94% of employees surveyed said that a personalised package, where you can pick and choose the perks most important to you, was “very” or “quite” appealing. Indeed, employers are increasingly using flexi-packages as a means of offering a wide range of benefits and increasing employee satisfaction and retention, despite the increased administration, cost and time demands involved in setting these packages up. Demand for flexibility is likely to grow, not only through flexi-benefits packages, but also how staff approach their work. Of those surveyed, just under half were interested in flexible working provisions e.g. access to remote platforms and co-working software. 93% of people interested in flexible working said it would make them feel more valued. This made flexible working the third most desirable benefit behind more holiday and an enhanced pension scheme. Indeed, with the elimination of many tax free provisions in the last few years, flexible and remote working is predicted to play a greater role in hiring and attracting staff. So what are the key points to remember when it comes to evaluating your benefit offerings? 1. Regularly consulting employees to assess how positively your people perceive their benefits. 2. Think about how age and demographic alters the priorities of those within your firm. Consider whether flexi-packages, accommodating the differing priorities of your staff, are feasible. 3. Think about how you can incorporate flexible working measures. The majority of consultant work is carried out on client site. But can technology be used to facilitate consultants working from home or remotely? 4. Consider a personalised and carefully crafted statement of benefits to all staff on a regular basis. Summarise their employment package and the value of their benefits – a PowerPoint or other document will help aid staff retention. 5. Ensure you know what your competitors are proposing. Stay ahead of the game rather than lose current and prospective people to better offerings. 6. Remember that a good benefits package is for most staff a secondary consideration after a good base salary. Although they may be the icing on the cake, benefits will not pay the bills. Our website includes regularly updated Insights and News which is an invaluable source of recruitment advice for both clients and candidates.